As experts in outdoor accommodation and property development, we have more than ten years’ experience in designing and developing Holiday Resorts and Villages in some of the most beautiful parts of France. It’s my dream to promote the Holiday Resorts and Villages concept, which is a terrific option that deserves to be much better known. I also place the utmost importance on offering top quality advice and support that’s very much tailored to individual would-be owners. Each client is unique. That’s why we offer them a real degree of choice when it comes to plots and chalet designs. We are there to help customers at every stage of the buying process. A ‘native’ of the Outdoor accommodation market, I soon gravitated towards mobile home sales. In 2010, when Luis Do Souto asked me to take part in setting up and developing Nature et Résidence, I accepted straightaway, given what I knew of him as a human being, a businessperson and a pioneer. I’m now the Sales Director of this company, which has a great future ahead of it – we’ve already helped design and market ten or so Holiday Resorts and Villages. Things are really starting to get exciting, now that we’ve so many projects on the go! After 25 years in the army, five of which were in a ‘sales’ role as head of armed forces recruitment, I really wanted to have a second career that would be as exciting as the first. It took just one meeting with Luis Do Souto and Éric Le Bizec at the beginning of 2018 to realize that I would embark upon the next episode of my working life with the Nature et Résidence team. I’ve always dreamt of managing a gîte or a guesthouse. Meeting Luis do Souto from Nature et Résidence over a year ago enabled me to turn this dream into a reality in the stunning setting of Corsica’s Costa Verde, on one of the last unspoilt stretches of the coast. My partner and I are originally from the Basque Country, and it took us 2 months to get ready for the move. Then, hey presto! Our Corsican adventure began at the start of 2017. I came across the Domaine de la Grenatière development by chance when out cycling. I wanted to try something new, so I got in touch with Nature et Résidence in 2015 to find out more about the project. I loved the idea straightaway. Thanks to my motivation and more than ten years’ experience in the tourist industry, I was offered a new challenge and I jumped at the chance. I’ve enjoyed it so much and I’d like to thank Nature et Residence for having put their faith in me and given me the opportunity to do something I love since April 2016. After having helped set up three Holiday Resorts and Villages (PRL) in France, I wanted to be the main player in creating a new development – and I wanted to do this with a partner who shared the same values as me. Thanks to a meeting with Luis Do Souto and his company, ‘Nature & Résidence’, I was able to complete the development of the ‘Domaine de la Grenatière’ project. 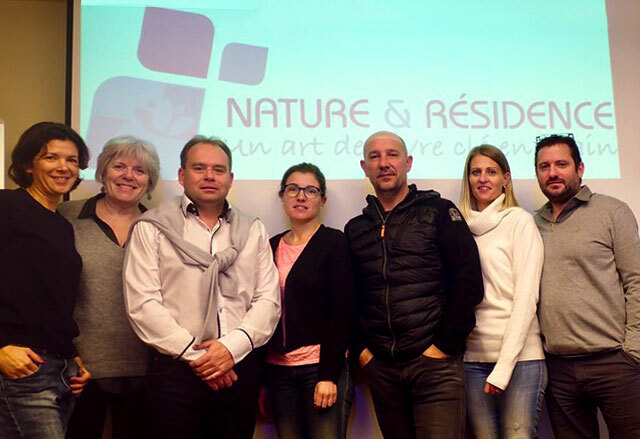 ‘Nature & Résidence’ is an SME with a very approachable team that’s been developing the concept of Holiday Resorts and Villages plots sold on a freehold basis in the most beautiful locations in France. It is now offering a completely new property management service, ‘Nature Holiday’s’. I’m involved in everything from meeting potential clients to more strategic decision-making. Above all, I get to take part in a genuinely exciting venture that seems to have a very promising future ahead of it!! Since 2003, I’ve filled the role of Administrative assistant and accountant for Luis DO SOUTO, who at that time owned and managed several campsites on France’s Atlantic seaboard. It’s been wonderful for me to have witnessed the foundation of Nature et Résidence and its subsequent expansion. This original concept revolves around giving people the chance to own their own plot and turn-key holiday home in rural locations across France. As a former student of the field of management, (combined with my experience in the tourist accommodation and real estate sectors), the Nature et Residence Holiday Resorts and Villages concept really appealed to me when I first came across it in March 2017. It’s a novel solution to the idea of having a holiday home. I get a great deal of satisfaction both out of promoting the company and organizing it with a view to its further expansion!